Still, despite taking on a new artistic moniker and composing in the veins of new styles, there are a few aspects of Christian’s artistic process that remained between one door and the next. Regardless of the primary topic of a song at hand, image-heavy, delicate metaphors and an interest in emotional depth have long perforated the songs Christian wrote, even if the outer face of his musical identity had changed. Now, more than halfway through 2017, Christian has donned another artistic hat. Though one could argue this hat is actually one he’s had all along but never let peek out from underneath the others. The hat in question is that of Stephen Christian, the solo artist. Just before the start of August, Christian unveiled his solo debut, titled, Wildfires (2017, BEC Recordings) and just as before, those listening from the outside in got to hear the unveiling of a new variation on the sounds with which Christian has crafted and surrounded himself. The freshness brought about by Christian not needing to support a collective mindset or secondary image made the approach of Wildfires seem like somewhat of an unknown abyss. Absent previewing released singles in piecemeal, the possibilities could be many things: musically leaning toward one past project or another, lyrically leaning in that same way, or possibly a third route entirely different from everything that preceded it. The truth, which comes swiftly even in the first line of opening track, “Trust” (In the valley of the shadow), demonstrates that Christian actually managed to travel every route of prediction for his solo venture. Wildfires contains essences of Anberlin, as well as Anchor and Braille but also packs a praising punch utterly distinct from both. All at once, the sonic presence Christian offers to his many audiences is expansive and, with the rollout of compressed to aurally widened drum fills, literally hard-hitting. The addition of clear, bright, and metallic toned lead guitar, followed by Christian’s signature reverberating vocal, makes these first few steps into the valley of Wildfires, feel much like the polished but vulnerable Anberlin of Cities (Tooth and Nail, 2007) and New Surrender (Mercury Records, 2008). The immediate injection of tonal familiarity is comforting as the record continues; especially since that bridge is the sole path of connectivity. Lyrically is where Wildfires is bound to turn or tilt a few heads. Christian’s surname might share commonality with a major western religion and he may have had no issue with going on record in previous interviews to say that “[he] just simply write[s] about life experiences, and when God comes out, then God comes out.” However, despite a lack of apprehension about including references to faith, God, and spirituality in previous releases, Christian has never made that particular voice the focus of his songwriting (Very early releases prior to Anberlin notwithstanding). Wildfires sees all bets off on this front and with this decision, a drastic shift in how Christian conveys his intended messages comes along. Subtle production luster and the moderate inclusion of an Anchor and Braille style of synthesizer contribution is handled with delicacy by Nashville engineer, Riley Friesen, who is credited with producing records by several decidedly Christian music artists. Friesen’s individual touch behind the board is evident and meshes well with the similarly crystalline results of his other engineering and production credits but he also seems to keep producer’s delicacy at the front of his mind because if Wildfires’ lyrics were changed to something less overtly religious, the resulting character would still sound like it could be from a hidden vault of Anberlin work. There’s no attempt to unequivocally shock people totally away from the style of Christian’s past musical lives but there’s no mistaking Friesen’s work with that of a previous producer; like some timid effort to emulate. The lyrical phrasing and major-leaning chord progressions become bolder as the album unfolds over its 10 track, 41 minute journey. 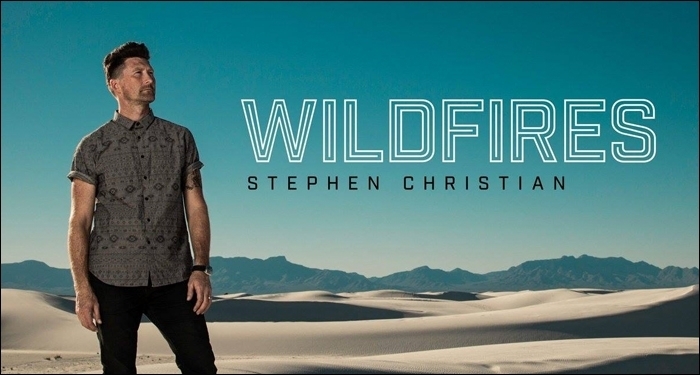 Never is there a moment when, out of context, a person might not presume or realize Stephen Christian the solo artist has a praise music message to share. The positivity and reassurance that comes with this type of purpose-driven music is satisfying on a human to human level, even if one does not reside in the space of Christianity. Many familiar with any of Christian’s work are liable to find some level of enjoyment in unfolding Wildfires simply because it provides music from an artist they have come to appreciate in one iteration or another. Where the only drawback appears to manifest – and really, confusion or curious inquiry might be more appropriate descriptors – is in the way these songs traverse a handful of minutes in a performance to make their points. As mentioned above, Christian is known for his use of image-heavy metaphors but much of his previous work also utilizes those metaphors within a network of clever wordplay, extended verse phrasing, complex vocabulary, and uncommon rhyme scheme. In other words, there have been approaches toward religious and spiritual subject matter that were delivered in linguistically intricate packages; never seeming to underestimate or take for granted Christian’s audience’s ability to hear and process that material. Yet, because Wildfires is a bonafide Praise/Christian rock album, and really, even a bluntly praise music-minded one to boot (Let Your light rise up overwhelm the dark / Let Your love in us show the world Your heart / Let Your hope resound for the broken ones / Let the lost be found and Your kingdom come), the lyrical intensity of the songs comes across almost like Christian holding himself back, given what he’s shown his pen to be capable of in the past. Nevertheless, given how long the multi-hatted rock star waited to finally pursue a project like Wildfires goes to show that in all likely hood, holding back is the last thing Christian is doing. Instead, he is free to write, perform, and record songs that highlight a part of his life that since the international momentum of Anberlin, become of notable significant: his pastoral work with the parish of Calvary of Albuquerque, New Mexico. Where trading almost mysterious allegory for straightforward choir lines can look like a stunting from the outside, the ability to focus less on finding the perfect obscure metaphor can leave room to devote emotional and literal energy elsewhere, and embracing the potential for an intangible shift in thinking and doing, well, isn’t what faith is all about? Wildfires available now on iTunes, Google Play, and Amazon via BEC Recordings. Find more on Christian’s pastoral work through Calvary Albuquerque’s official website. Stay connected with Stephen Christian through these social media outlets.